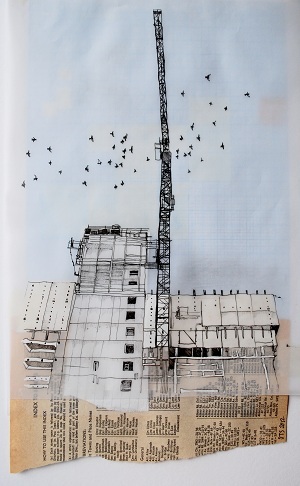 The city and its relationship between humans and architecture are the starting point for Sarah Taylor Silverwoods finely detailed drawings and text-based works. Living City refers to the 19th-century idea of the ‘flaneur’ – someone who walks the streets of the city in order to experience it – and the writings of the literary masters such as Charles Baudelaire and Walter Benjamin, as well as contemporary comic books. These delicate and intimate drawings are presented alongside the in-depth research that informs them, including the artist’s maps and sketchbooks, and historical texts, all of which explore our complex and ever-changing relationship with the metropolis. Sarah Taylor Silverwood is currently artist-in-residence at the University of Birmingham. See website http://www.birmingham.ac.uk/culture/artistsinres.aspx for more information. Above image:© Sarah Taylor Silverwood, Birmingham Skyline, 2012.